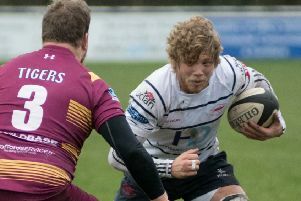 Preston Grasshoppers ended their three-match losing streak and moved back to ninth in National League Two North with a hard-fought victory over top-six side Otley. The defeat rounded off a troubled day for the Yorkshiremen, who arrived in Preston without their kit and caused a 30-minute delay while it was whisked over the Pennines by car. Arnold will have plenty to work on in training this week ahead of Wharfedale’s visit as there were several worrying areas of Hoppers’ play. They stuttered at the line-out when in good positions and occasionally showed a fragility in the tackle. On the credit side, they stuck to their task and might even have picked up a four-try bonus point had a couple of decisions gone their way. Recent recruit Ryan Carlson, from Natal, made a big impression in the back row and the home pack again had a big edge in the scrums. Otley had the first chance of points but scrum-half Joe Rowntree missed a mid-range penalty in the first minute. Hoppers quickly capitalised, with Ally Murray crashing over from a line-out drive and Tom Davidson adding the conversion. After Scott Jordan took his side into a good attacking position, James Fitzpatrick thought he had a try, but referee James O’Brien ruled that the ball had made contact part-way up the post, rather than against the base of it. So Hoppers had to settle for a Davidson penalty for offside. They kept the pressure on and Matt Lamprey bagged his 11th touchdown of the campaign from a five-metre scrum, with Davidson again converting. He and Rowntree exchanged penalties, but Otley battled back and fly-half Tom de Glanville bamboozled the entire defence with a mazy run to the corner. Rowntree’s conversion made it 20-10 at the break. Despite strong attacking efforts by both sides in the second half, there were only 10 minutes left on the clock when the next score came. Arnold had taken himself off soon after the break, but brought himself back to bolster his side’s efforts, before Hoppers thought they had bagged the bonus point when Pete Altham crashed over. But Mr O’Brien ruled that both he and his touch-judge were unsighted when the ball was grounded. Hoppers soon closed out the game when Lamprey was held from a five-metre scrum but Murray was on hand to claim his second try. Both sides had late chances to score but it ended 25-10.